Coffee comes from the Arabic word ‘gahwah’. Before its use as a beverage 800 years ago, coffee was a food, then a wine, and then a medicine. According to a legend, coffee was discovered in Ethiopia when goatherds noticed that their flocks stayed awake all night after feeding on coffee leaves and berries. Coffee is a favorite beverage in almost every country of the world. More than 400 billion cups are consumed each year. It is a world commodity, second only to oil. More than a hundred varieties of coffee may be found in retail shops. 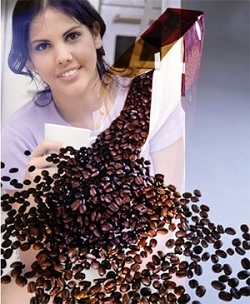 Coffee may be divided into 3 general groups – Brazils, Milds and Robustas. While Brazils is the coffee grown in Brazil, the Milds include all coffee grown outside Brazil. Coffee Robustas is a different kind of coffee, mostly grown in Africa. Mostly coffee is named after the region where it grows or the port it is shipped from. Coffee making is a long process. The coffee berries are harvested and put through a bath of running water called a sluice. The good berries go to a pulping house where the beans are separated from the pulp. The beans are then dried and left to cure for several weeks. Then the beans go through a process called hulling and peeling after which they are roasted. They are then ground and packed. Coffee is widely used as an energy stimulant along with milk and sugar. The stimulant effect is due to its ‘caffeine’ content, which is double the amount present in tea. One cup of coffee contains about 60-70mg of caffeine. This amount temporarily increases mental alertness and energy levels, which in turn reduces drowsiness. So it is widely used as a wake up drink in the morning and as an energy booster during the day. Caffeine acts on the Central Nervous System (CNS) and stimulates the Cardiovascular System (CVS), thereby raising the blood pressure and heart rate. (c) High caffeine consumers (those who drink more than 5 cups daily). This category is definitely at a high risk. Today coffee ‘pubs’ and cafes are the ‘in’ thing and are mushrooming in metros and even in smaller cities. They have given birth to a new industry overnight – the social beverage industry or the coffee retail industry. Collegians hang around Barista, CCD, Coffee Mantra, Quicky’s, Starbucks and so on. The creamy russet brew has definitely come to stay.